Does helping someone stuck with a complex problem excite you? Are you eager to put your expertise to good use? Would you like to help a business or a researcher write an algorithm, analyze their data, or develop a product? 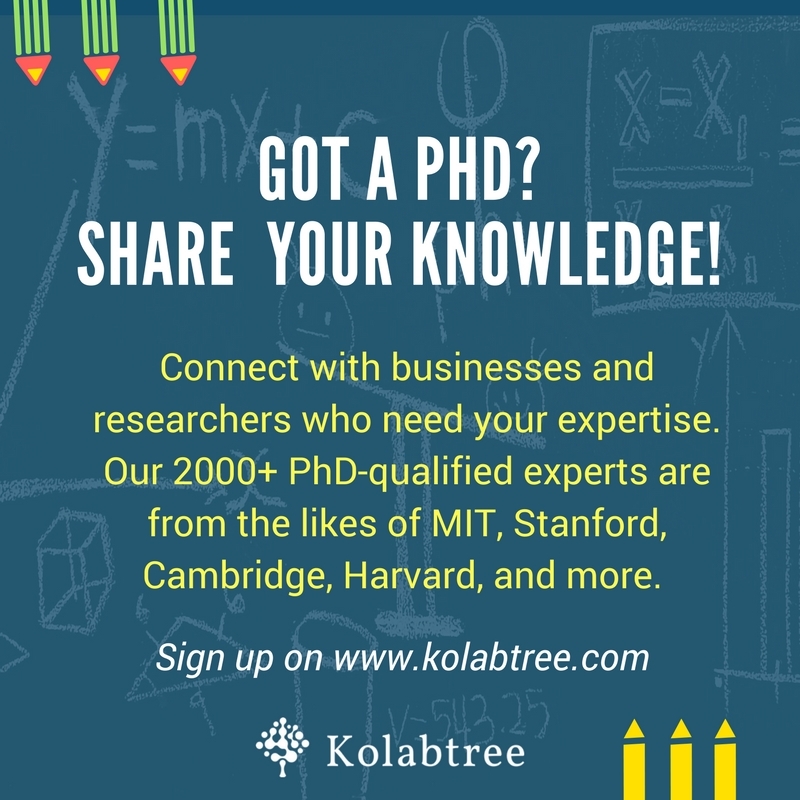 Join Kolabtree – a platform that matches freelance PhD-qualified experts with projects that need their skill set. Kolabtree now has 5000+ PhD-qualified experts from institutions such as Stanford University, Harvard University, Harvard Medical School, MIT, Cambridge University, Columbia, Caltech and Oxford University. Kolabtree functions on a marketplace model where experts can bid for high value projects across services such as data science, scientific consulting, statistical review, literature search, experimental design, editing, and writing. For example, we’ve helped a food entrepreneur in the USA hire a food scientist in the UK for help with making gluten-free bread, and a social science researcher at Stony Brook hire a data scientist from Imperial College London for analysis of large datasets. Our scientists come from a variety of backgrounds, specializing in life sciences (biotech, bioinformatics, molecular biology, etc. ), physics, mathematics, data science, machine learning, and more. You could help someone conduct a statistical analysis, or provide the latest research on a particular subject to a business/R&D facility, help a startup design the right algorithm for their platform, or maybe advise someone stuck with designing a suitable test for a research study. You can quote your own price while bidding for projects. Clients are required to deposit the entire project fee in an escrow account, and freelancers are paid once the client indicates that s/he is satisfied with the output. For long-term projects, payouts can be done based on mutually decided milestones. If you’re a Postdoc/PhD looking to explore an exciting freelance consulting opportunity, get started by signing up on Kolabtree as a freelancer. The Kolabtree Blog is run and maintained by Kolabtree, a platform that connects researchers and businesses to experts around the world. © Kolabtree Ltd 2017. All rights reserved.